Can you tell which is which? If not by looking, you can feel the difference as the face grain is smoother. The chef and serious cook will know as the knives they use are crazy sharp and they chop – a lot. The face grain planks are pieces that are milled from the tree trunk in the direction of length, sometimes called longitudinal. End grain planks are pieces are cut across the growth rings. Did that makes sense? 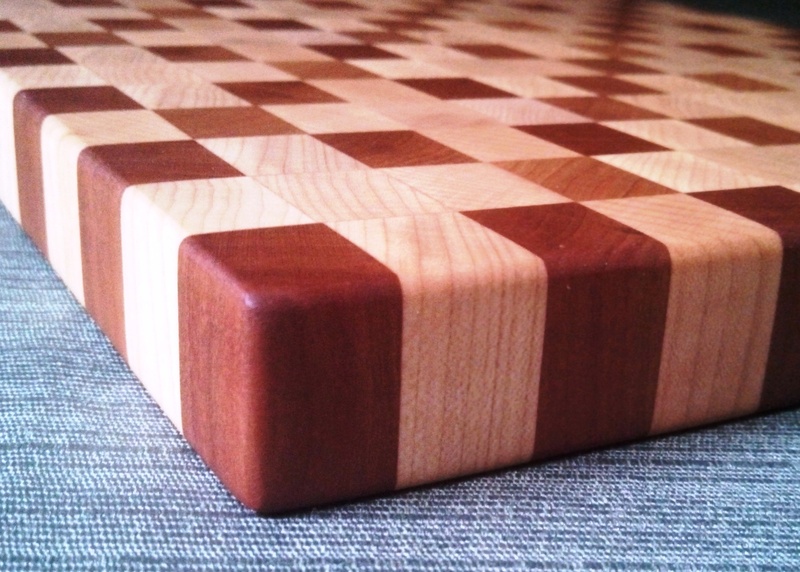 End grain boards are a wonderful option for cutting boards and butcher block tops. The grain created surface is very strong, during chopping, the wood fibers absorb the knife cuts which is pretty darn cool. The “2nd step” of face grain pieces being cut to size, turned onto their side – end grain up, glued and clamped, will add to the labor – hence increasing the price. The end grain option offers quite an advantage – durability. The face grains are pretty and fun – will they show the knife marks sooner, nicks and gouges? Yes they will. Chop away until you can’t stand it and buy another. 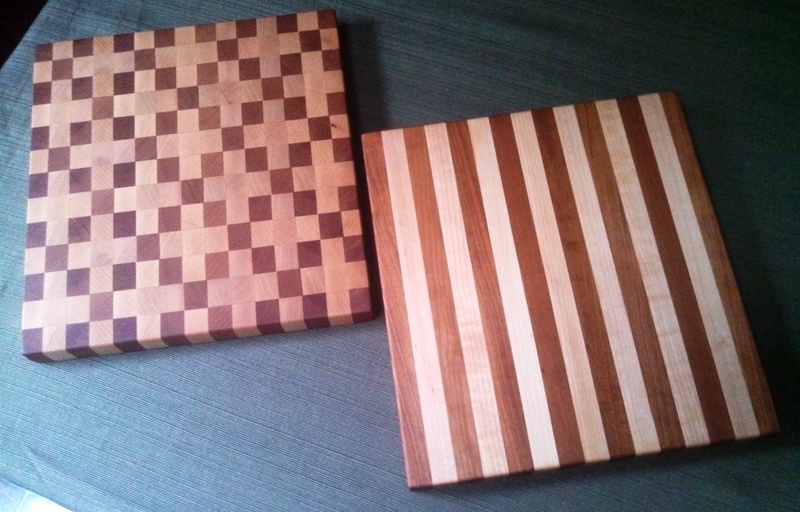 Do the end grain designs give you more creative and stunning designs? I think so. If that is what you want. 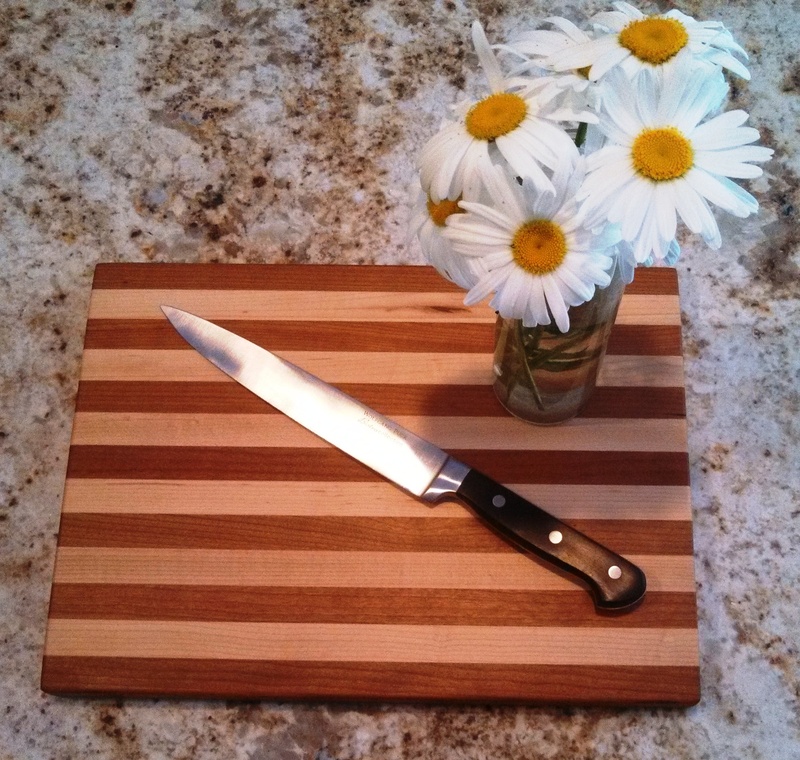 We pride ourselves on making artisan quality wooden cutting boards, face grain or end grain. Both construction methods are winners – depending on what you need – want – and your budget. “This piece is made from an old sawmill blade, found right here in Tennessee. We cut out the shape, refine it on the belt sander, grind the blade road, heat treat the steel for maximum hardness and edge retention, then hand sand/polish each blade. 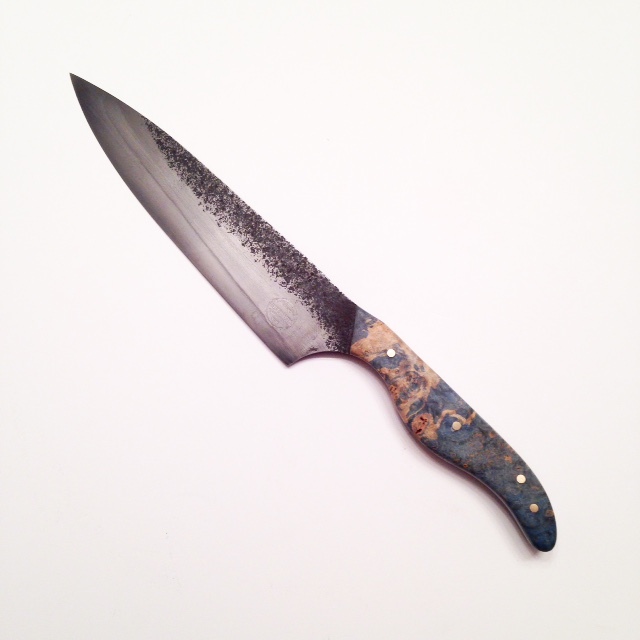 This particular blade has also been dunked in an acid bath or ferric chloride to help it resist rust. The darker patina that is formed with eventually be replace by the custom patina of the user. Depending on where the chef or cook cuts the most, where they hold it, and what types of food they use it on, will determine the beautiful patina that is achieved. The high carbon steel blades take a bit more care, but they will last a lifetime if taken care of” – Jared at Boot Hill Blades. Face grain glued up to end grain? 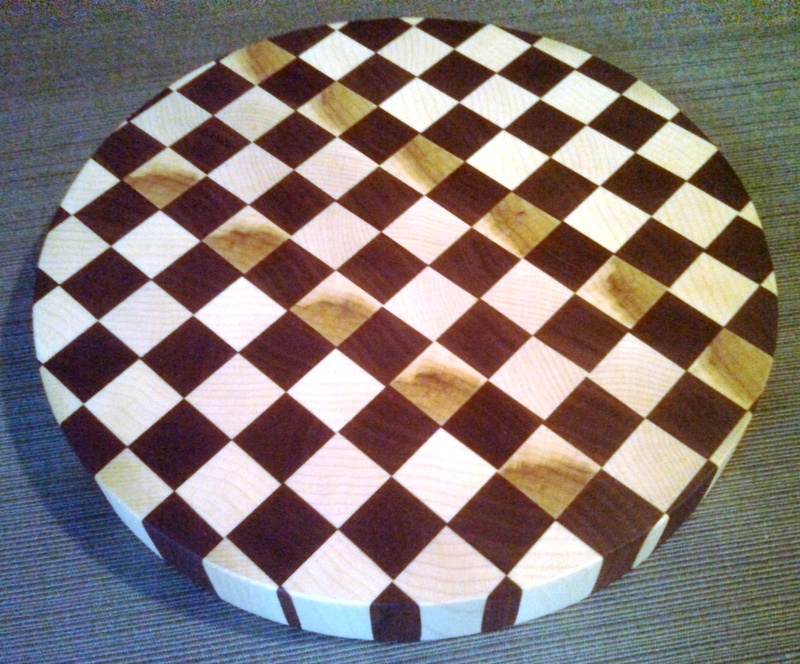 Not for chopping on, but perhaps a table top….stay tuned as I have a chess board idea in mind. 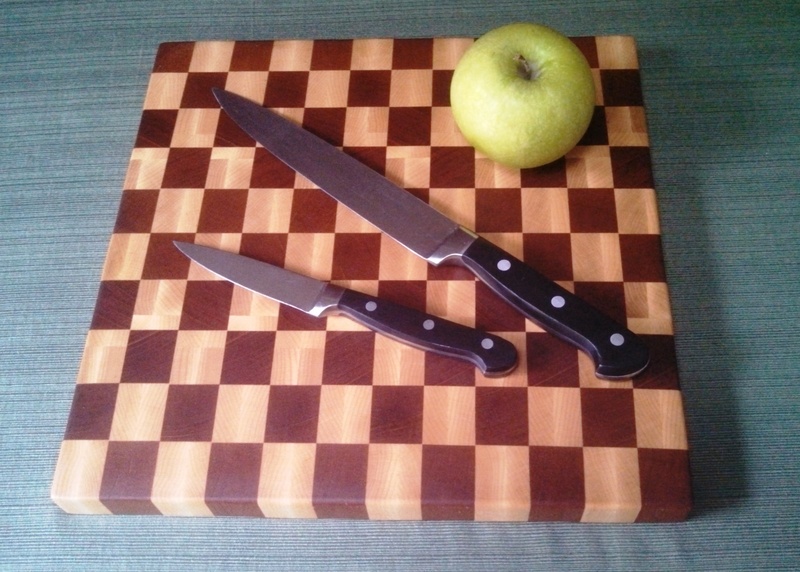 This entry was posted in Creative Woodworking and tagged artisans, chef's knife, Creative Woodworking, cutting boards, end grain, evergreen, face grain. Bookmark the permalink.